We offer lifetime free technical support and 12 months of worry-free warranty, worry-free replacement or refund. We promise that every product undergoes rigorous testing before packaging to ensure that every product receives the best products and services. If you have any questions, we will respond to you within 24 hours. [Secure & Comfortable Fit] - This Bluetooth Earbuds are ergonomically designed with oblique angle to fit your ear canal better and reduce noise. Extremely lightweight and perfect size, you won't be uncomfortable after a long-time wearing. [Quality Stereo] - Clear, crystal-clear sound and powerful bass with dual wireless headphones. Hands-free calling, last number redial, third-party calling and call alert to meet all your needs! [Battery life is longer when charging] - Ultra-low power consumption for 2 hours of high-quality playback time. The portable design of the charging dock has a built-in high-capacity battery that supports up to 6 times the wireless earbuds. No longer worry about running out of battery, losing any calls or stopping music. 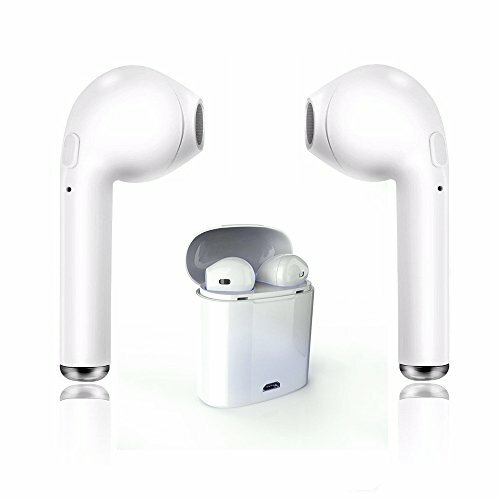 [Real Wireless Bluetooth Headset] - The latest technology makes true wireless earbuds possible, and it completely protects you from cable clutter. Advanced Bluetooth technology provides an extended 33-foot range for ultra-fast pairing with other devices such as Android. If you have any questions about this product by baiyi, contact us by completing and submitting the form below. If you are looking for a specif part number, please include it with your message.